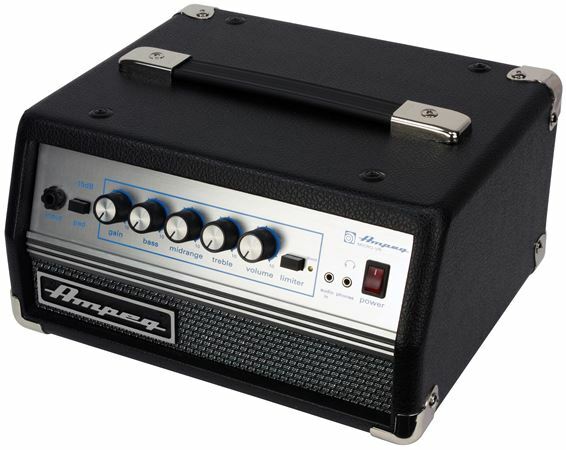 Shop Ampeg MicroVR Bass Guitar Amplifier Head from AMS with 0% Interest Payment Plans and Free Shipping. 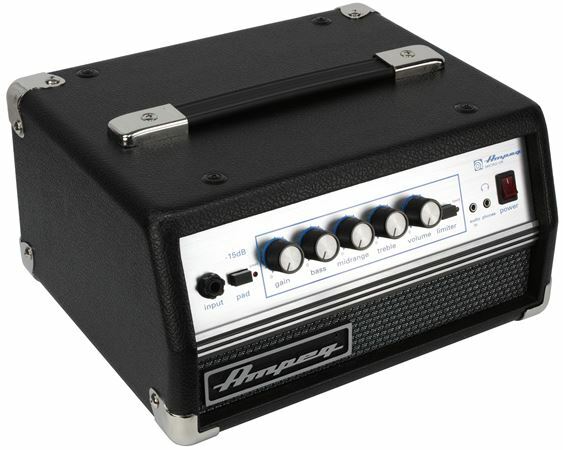 This portable, powerful solid-state head in traditional Ampeg drag is a pleasant surprise from the second you lay eyes on it to the moment its indisputable Ampeg tone hits your ears. 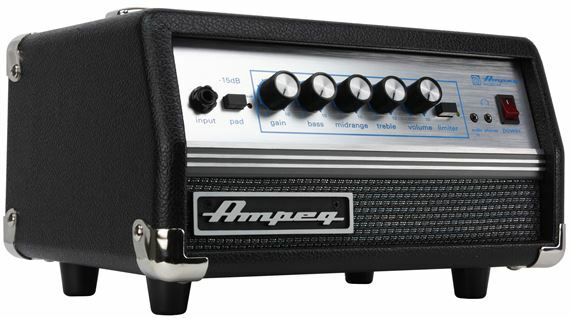 The Ampeg Micro VR Bass Guitar Amplifier Head is a compact powerhouse fully capable of pumping its 200 watts of genuine Round Sound into myriad live and recording situations. 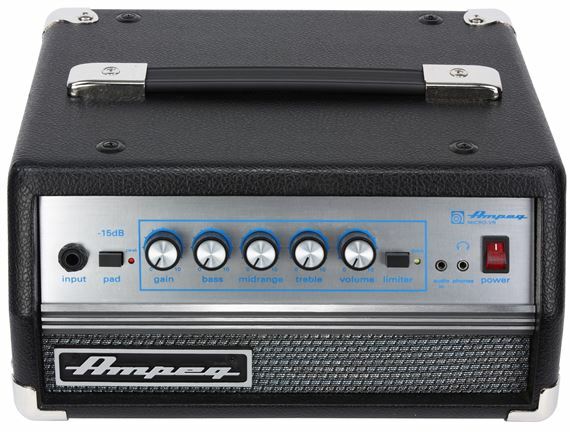 A perfect companion to the Micro VR is Ampeg's SVT210AV Micro Bass Guitar Amplifier Cabinet. with 300w with 1x15 & VST2x10 lets you feel the backbone of the music !! LOVE this RIG !!! It really is a great deal for what it is and how it sounds and performs. So glad I finally got it, have looked at it for a few years and never did it but wow it is worth it. This product is wonderful for the gigging musician who doesn’t want to lug crazy heavy equipment around. It can plug into any cab and deliver an earth rumbling sound. Also can be quiet enough to use inside the bedroom. 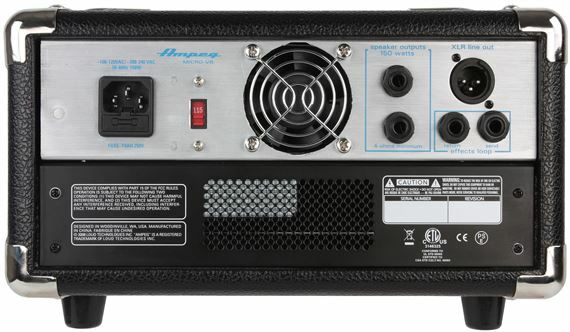 It is a "best of both worlds" type bass amp, and I recommend it to any musician. They laughed @ The Wright Brothers!!!!!! It,s put together fine the only snagg is the black paint on the speaker cab, who ever painted it could have used a roller. Paint strokes every way.Quailty Control???????? Light weight and can move it around, get it in a Bug!! !Did upgrade the speaker cable to Monster,will get covers!!! Now the SOUND is Ampeg and yes if pushed it will brakk alittle but thats were E.Q. comes in.I use the Tech 21 VT box and E.Q. her dial in and out the bass freq and get a nice full fat sound, and don,t 4get the limiter U can get some nice sounds just got to dail her in. I do own a July 1969 Linden New Jeresy SVT and also getting the new AV Model.But she,ll be on stage when I play out just keep in mind she does have a limit so have funn and Good Hunting!!! just like my 69 Nova. So far so good. The tolex isn't peeling on mine, so maybe they've got that solved. The extreme lightweight of this amp is fabulous. It is a rather anemic 150 watts though. I get way more volume out of a 60 watt Vox and a 100 watt Fender Rumble. Tone is very Ampeg. Thru the Av210 cabinet, the low end distorts a bit too much. This amp sure doesn't feel like 150watts into 8 ohms. Cute, easy to move, quite under powered though. Won't cut it for most gigs. Feels chunky and round. Very Ampeg in character. Not very solid on the lowest notes though. Signature Ampeg tone. What more can be said. Can die on you anytime. Nope. I bought it new, I used two compatible 2-10" ampeg cabinets with it at 8 ohms each. Two weeks later I could smell a burning wire odor while I was practicing even while my volume was low, gain was at 4 o'clock and volume was at 3 o'clock. Then suddenly it lost its volume drastically with a distorted sound. Returned it to the seller(not AMS)and got my refund. 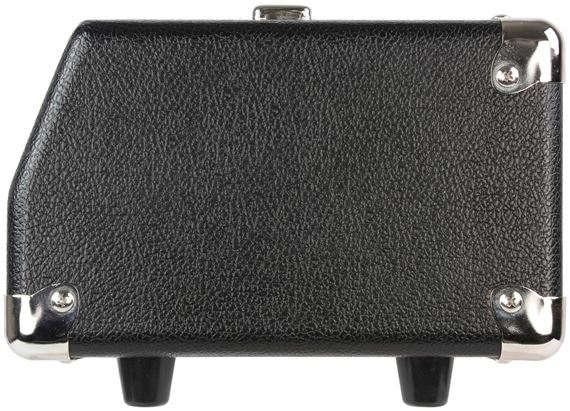 I bought the Ampeg Portaflex PF500 Bass Head from AMS instead. 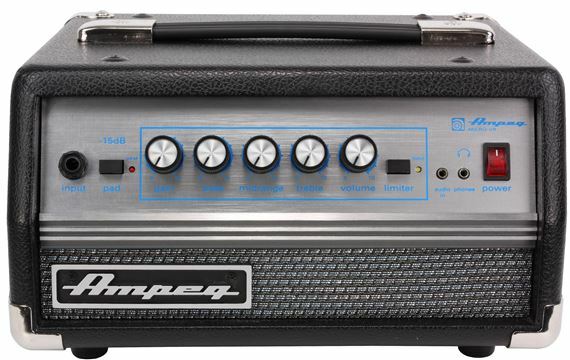 I did some research on AMPEG products, they are now made in China not USA, but only the SVT Heritage is made in the USA. This is a common problem with the Micro VR bass amp head,it can conk out(burn out)on you and lose power. 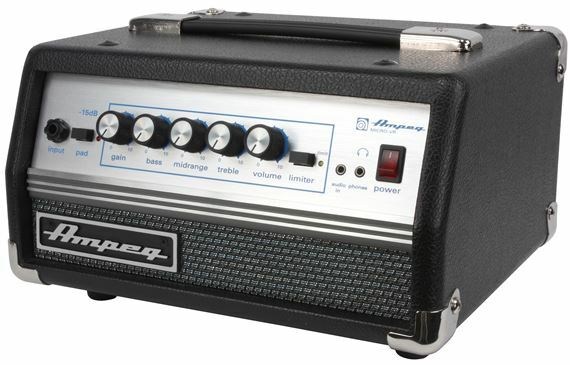 Ampeg Quality is not the same as in the past when the Ampeg products were made in the USA. I wish I kept my SVT with 8 10" speakers cabinet when I bought it in the early 70's. Had to sell it because it was too heavy to lug around to the gigs. Has that SVT sound and very light weight compared to my old SVT head back in the 70's. Good classic SVT sound. A little too much midrange on the sound. It's good if it lasts and does not burn out in the middle of a gig. mid range to bassy type sound. First, let me just say that I REALLY love the tonal quality and sound that the Micro-VR Head & SVT210AV cabinet combine to put out. Second, for my application – home studio recording – it’s absolutely perfect in terms of the sound quality, portability, weight, and ease of use with its very basic features. And both seem well-made despite manufacturing in China. It’s a keeper! My biggest disappointment is with the stated power rating of 150W into 8?, 200W into 4?. The head plus one cabinet didn’t seem to put out more sound than my old standby Brit-made Marshall Bass Sate 30, rated at 30W. I got a second SVT210AV but I am not convinced that I’m really getting 200W. Fortunately, there is a post-EQ XLR out so the front-of-house engineer can run with your signal if the SVT210AV’s don’t deliver on the volume you need. Gigging musicians may find the Spartan features lacking for their needs on stage. But, there’s an effects loop to insert whatever one might need to fill that gap. Flexibility to shape a wide tonal palatte. Oh Yes! It's got the Ampeg Sound! Wish it had a metal jacks. Really like the built-in limiter. I haven't found a use for the -15 pad, though. Light as a feather! 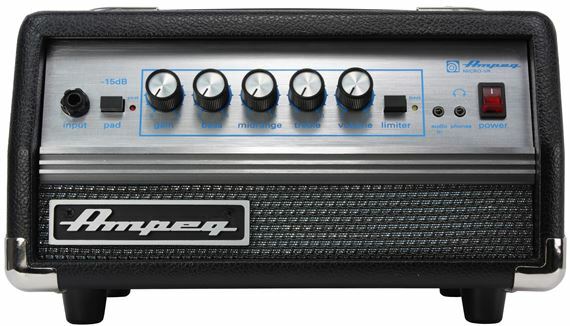 I love pulling a gag on my fellow musicians by handing them the amp and saying "here, carry my heavy Ampeg head for me?". They brace themselves, they grab the amp, then they are astonished! The look on their face is priceless. If you agree that The Ampeg (SVT) Round Sound is the holy grail of bass guitar amplification, you will NOT be disappointed. Somehow they actually engineered in "That Sound". Buy a cover for it at bscovers.com, and you're all set. And I think you'll find that the 200W's will be loud enough for almost anything you gig. I've powered a wall of speakers with it, no sweat. Simple, but brutal punch and power..Single channel..Simply adjust the midrange or gain...You have 3 different sounds...effect loop..Headphones jack.. input for mp3..XLR out..CAN RUN 2 SVT 210's.. Feels good @ 11 lbs. Amp that is.. Built like an Ampeg....Wish they'd put the right picture of it onsite..its confusing..Oh well..